Chronic malnutrition in Rwanda remains a serious problem. The cause of this problem is not only a lack of sufficient food quantity, but rather lack of knowledge regarding proper nutrition and the growing and preparation of a wide variety of vegetables. With the help of a former African Great Lakes Initiative volunteer from England, through her Growing Together in Rwanda project, we were able to develop a project to teach low-income people (especially HROC trainees) how to overcome poverty and malnutrition. 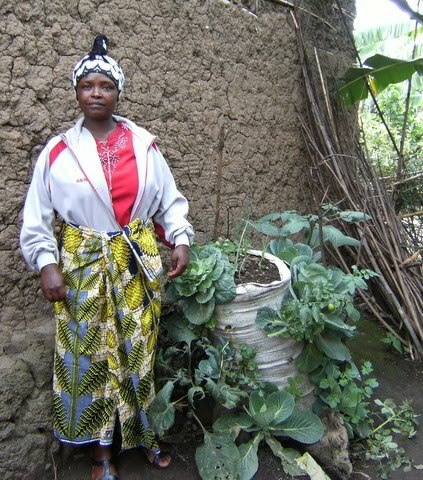 People were taught how to use small space/land to cultivate vegetables. Besides learning how to cultivate vegetables, people were taught how to cook them. As of the past several years, the Rwandan soil has not been giving enough harvest due to erosion and use of chemicals as fertilizers. In order to reactivate their soil and have enough harvest, participants requested that we give them domestic animals such as goats, sheep, cows, etc. These animals will help people get natural compost by using their droppings, get milk and get to develop together as well.